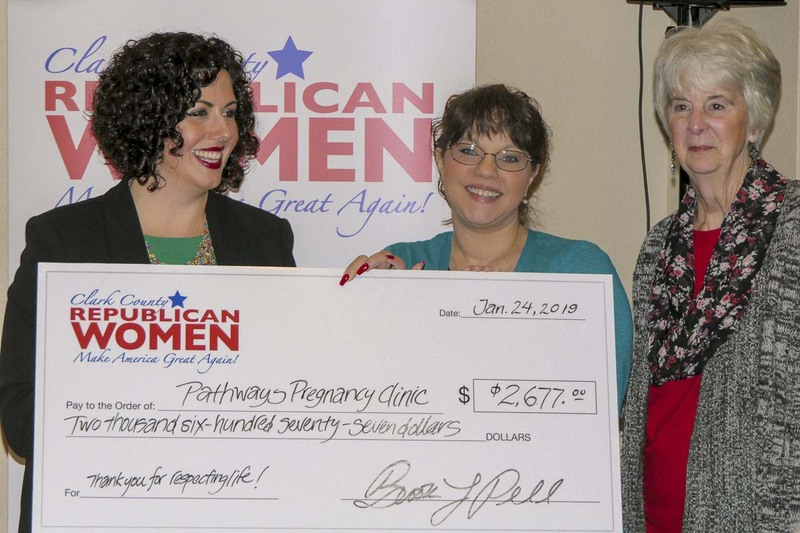 VANCOUVER — During their first meeting of the year, Clark County Republican Women (CCRW) presented a check to Pathways Pregnancy Center of Camas and Washougal. The $2,677 check is part of CCRW’s annual “Impact Award,” an effort to give back to the community through charitable fundraising. Each year, CCRW membership designates a local 501c3 non-profit that has a profound impact on women in our community. Contributions are raised by members with a matching donation from CCRW funds. Pathways Pregnancy Clinic is a faith-based organization that provides a safety net to young women who are faced with the fear and uncertainty of an unplanned pregnancy. They provide free pregnancy tests, ultrasounds, and life skills training. Pathways is open Monday through Friday and located at 2926 E Street in Washougal. For more information about services, call Pathways at (360) 834-2829 or email clinic@pathways180.com. At the meeting CCRW members were also asked to give their recommendations for future local nonprofits to benefit from the next Impact Award. CCRW is a fast-growing Republican Women’s organization and is currently one of the largest in Washington State. Find out more information about the organization and how to join at ClarkCountyRepublicanWomen.org.